In December 1989, 5 years after Fr. Walter’s death, the Father Walter J. Ciszek Prayer League began its quest to seek the Canonization of Father Walter Ciszek. Then-Bishop Michael J. Dudick began the official diocesan process of investigation for the Byzantine Catholic Eparchy of Passaic, NJ and the Father Walter Ciszek Prayer League in Shenandoah, PA was formally incorporated as the Official Organization for the Promotion of the Cause of Canonization of Father Walter Ciszek. With the arrival of Bishop Andrew Pataki as the head of the eparchy of Passaic, the cause was transferred to the Roman Catholic Diocese of Allentown, under the auspices of first, retired Bishop Thomas J. Welsh, D.D., J.C.D, and then Bishop Edward P. Cullen, D.D in 1998. In October 1990, official permission to proceed was received from Rome. The first phase of the Canonization process – the “Diocesan Inquiry” began and Father Ciszek was given the title “Servant of God.” Over the next 16 years, materials and documentation spanning Fr. Ciszek’s entire life were accumulated. Collected information included documentation of his 30year absence from America that included captivity for more than two decades in the former Soviet Union and his return to America, which was followed by priestly work at the John XXIII Center at Fordham University, now known as the Center for Eastern Christian Studies at the University of Scranton. 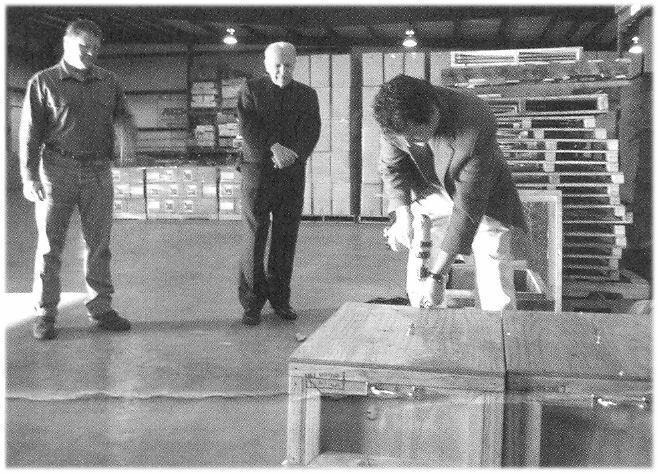 Personal correspondences, writings (both published and unpublished), photos, interviews with members of his family and friends and thousands of pages of other assorted documentation were assembled and catalogued at the Father Ciszek Center in Shenandoah, PA.
Bishop Cullen places his seal on the shipment before its four day journey to the Vatican. properly. Everything had to be tightly packed and sealed to avoid any type of damage to the files. 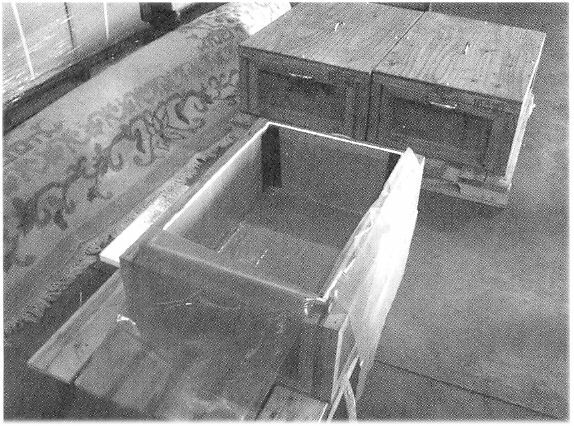 Also, special security arrangements were required – the crates had to be under constant video surveillance except while in flight. The crates were then transported by a special shipping company to the John F. Kennedy Airport in New York to board a flight to Brussels, Belgium, before arriving in Rome and being placed into the hands of Vatican officials four days later. About 3 weeks later, Msgr. Muntone joined Father Molinari in Rome to present the documents to the Congregation for the Causes of Saints. 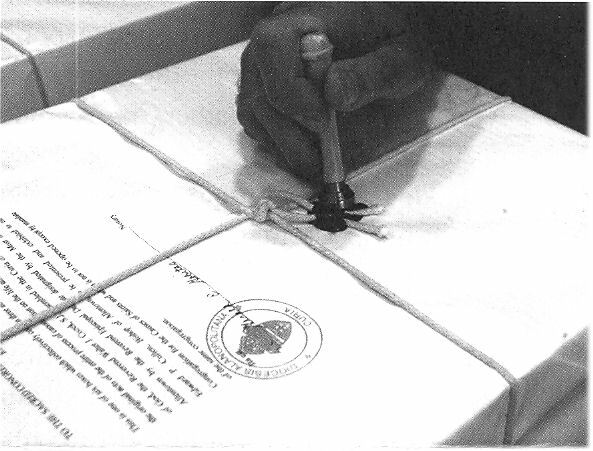 In May 2007, as was required, boxes containing original copies of the documentation that was sent to Rome were placed in a sealed archival room in the Diocesan Bishop's office. constant video surveillance except during flight. Once the Congregation formally opens the documents the second phase of the process begins, which entails the Congregation officials examining both the testimony given by the witnesses and all the evidence contained in the documents assembled during the diocesan phase. The Congregation next appoints a "Relator," whose responsibility it will be to oversee the preparation of a "Positio," an exhaustive exposition of the life and virtues of Father Ciszek. Finally the theologians of the Congregation will consider the theological aspects of the cause. Then the Positio and the observations of the theologians will be presented to the cardinals and bishops who are members of the Congregation. If all meets with their approval, the results of their study will be submitted to the Holy Father, with whom rests the decision as to whether it has been shown that Father Ciszek lived a life of heroic virtue. If that decision is positive, the Congregation will wait for the results of investigations into two miracles. If the first is accepted, Father Ciszek would be beatified. With the acceptance of the second miracle, he would be canonized. If anyone has received an answer to prayer through Father Ciszek's intercession that seems miraculous, they should send notice of it to Msgr. Muntone at St. Elizabeth Rectory, 618 Fullerton Ave., Whitehall, PA 18052.